Naomi, left and Ruby, right, have been at the centre for almost a year. An animal rehoming charity is looking for new owners for a pair of dogs who have been left in its care for almost a year. Ruby and Naomi, two Staffordshire bull terriers, have been staying at the Scottish SPCA’s rescue centre near Drumoak for more than 300 days. Staff at the charity are now hoping to find a permanent home for the pair of pooches. 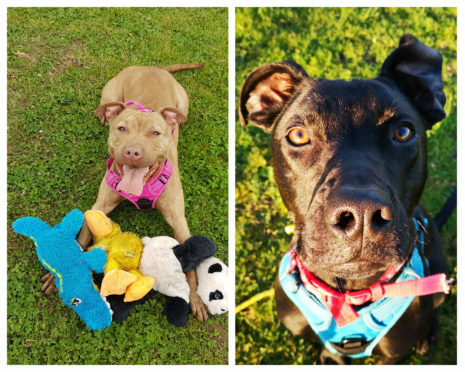 Graeme Innes, the centre manager, said: “Five-year-old Naomi, and one-year-old Ruby are both in need of an adult-only home with owners who have experience with staffie-type breeds. “As they are very energetic girls, they will require a lot of patience in their new homes. “Naomi loves her toys and could play for hours on end with her teddies. “She is slowly starting to understand the concept of fetch, followed by a belly rub. Anyone who wants to adopt the dogs can call the Scottish SPCA on 03000 999 999.